This week I was with a client working with their leaders on strategies to increase the level of productivity out of the sales force. The feeling was the sales team wasn’t engaged and committed. The strategy I shared (which I’ve used with numerous other clients) is to have a quick sales meeting at the end of the day. The objective of the end-of-the-day sales meeting is to have people share what they learned today. Idea is if the sales team knows they’ll be sharing the big idea they learned, they’ll become more aggressive in making sure they learn something of value. With each person sharing a quick idea, it creates an environment where people are learning from each other. After each person has shared, it’s the sales manager’s role to challenge them to use what they learned today to help them be more effective tomorrow, and in so doing, challenge them to succeed the next day. Total time required for a meeting like this is 15 minutes, and by doing it at the end of the day, it helps people feel good about their job when they leave. I like this approach because if the team feels good going home, they’ll be much more likely to feel better coming to work the next day. For sales teams focused on prospecting, having them motivated is everything, and yet you as a manager can’t motivate anyone. All you can do is create an environment for them to motivate themselves. I’ve found the end-of-the-day sales meeting does just that, and because it’s at the end of the day, it has a very high ROI for the time invested. 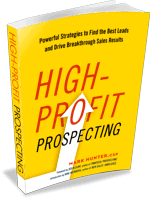 If you haven’t yet picked up a copy of my new book, High-Profit Prospecting, I would certainly suggest you do. It’s full of ideas to help you and your team prospect more effectively. You can find it at this link.